“Registration as workers is the legal right of Home Based Workers”. This was demanded by women present at the first ever celebration of Home Based Workers Day jointly organized HomeNet Pakistan and Labour Education at Lahore Press Club. 20th October is remembered as a historic and an important day for the Home Based Workers of South Asia including Pakistan. As on 20th October 2000 South Asian countries passed a declaration for the home based workers. This year those countries celebrated first ever home based worker’s day. Home Net Pakistan and Labour Education Foundation also celebrated this day by lighting candles in front of Lahore Press Club. Large number of Home Based worker’s were present at the occasion, they were carrying placards and posters bearing their demands. The demands were: Ratify ILO convention for Home work C-177, devise a national policy for home based workers, implement 7000 minimum wage, provide social security, old age benefits, pensions, right to health during work, provide facilities to women worker during pregnancy, grant unionization and CBA rights, provide equal wages and home based workers to be recognized in government statistics and economy. Nobody in Pakistan postal services is in the position to solve the problems of union. Saeed Hameed Ahmed has been striving for the worker rights of Pakistan postal services since 1957. He formed an “All Pakistan Postal Employees Union” and provided a collective platform to the workers to battle for the rights. The union was registered in 1957 under article 10/79. The problems faced by the workers in this sector are numerous. Postal services have a total of 47000 workers and out of them 70% are permanent while 30% are temporary. 1979 was the last year when the Pakistan Postal Services had Union elections and since then no election or referendum could be done. This indicates the atrocities being faced by the workers. He appreciates the effort being done by Labour Education Foundation and National Trade Union Federation to raise awareness of workers and to discuss their issues regarding privatization and related problems. Ship breaking industry earning Billions annually is being ignored by the Government institutions. On 27th September a seminar was held in Karachi on the topic of working conditions and rights of workers of the Gaddani Ship Breaking Industry. A large number of workers and trade union representatives related to this industry participated in the seminar. Gaddani’s 15km beach holds the country’s only ship breaking industry which started its working in 1967. Spread over 127 plots, annually 140 ships from around the world are brought here for breaking. The steel extracted makes a sizeable contribution in meeting country’s steel demand. Other metals include aluminium and bronze. 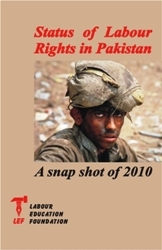 More than 15000 workers are forced to work in poor conditions. The profit earned from this industry is in billions but the workers associated with this profession are ignored and never given due recognition. Labour laws are not implemented in this industry. Though they have been associated with the profession since 20 years but they are not given appointment letters. Due to this they are unable to get social security benefits. Workers work for 12 to 14 hours on minimum wages. Though the work is quite injurious to health but no personal protective equipments are provided to them. More than 100 workers including numerous have been injured during the course of work. They are denied of any access to clean water, health facilities and electricity. We will protest until our demands are met. All primary teachers Association Khyber Pakhtoonkhawa is on protest since October 1st and from 22nd October classes are being boycotted too. The association is planning to stage protests rallies and demonstrations for the rights of teachers throughout the province during the month of November. All Primary Teachers Association Khyber Pakhtoonkhawa started their struggle for rights on 9th May 2011 with a convention in which around 6000 teachers participated. They are demanding for implementation of service structure and time scales, primary teachers to be given 20% quota in SST, CT fund to be replaced by GP fund, restoration of advance increment on over time, increasing education budget, primary teachers to be given 50 % quota in University and board examinations, EEF and benevolent fund to be spent on building schools, colleges and on residential schemes for teachers, introduce teacher’s welfare foundation, ending one time 2007 up gradation, rejection of collector system and education privatization. Teacher’s are still on protest and the government does not seem to be serious in resolving the issue. There has been no progress since one month when the association announced boycott of classes. Daily waged workers of Nestle Pakistan’s Sheikhupura factory are facing numerous problems. Their wages are not increased, denied of benefits such as weekly and annual holidays. Labourers are living awful lives throughout the country. At one level they are not being paid in relation to inflation and at the other end they forced to work as daily wagers in factories. Working as daily wagers they are denied of not only weekly holiday but of monthly holidays too. There is no process to raise their wages. All these problems are also being faced by the workers of Nestle Pakistan Sheikhupura Factory. The factory has 5- 6 thousand workers. 30-40 women are working in the administration and most of them are daily wagers. They have been working for approximately 14 years and their daily pay is 317 rupees. They don’t have access to social security and EOBI. Only relatives and influentially strong are permanently hired. Since 4 months at least 60 workers are jobless. They are living in rented houses and are in dismal living conditions. In these pathetic and pitiable conditions they are demanding that their worker’s be freed and their jobs to be restored, previous four months salaries to be paid, permanent worker status should be granted, annual and weekly holidays to be given.